On June 12, Make the Road Nevada (MRNV) members, including immigrants and survivors of the deadly shooting that took place on October 1, 2017, in Las Vegas, gathered outside police headquarters to meet with Sheriff Joe Lombardo of Clark County. This shooting marked the deadliest mass shooting in the history of the United States which left 58 people dead and more than 800 injured. For the past eight months, shortly after the Route 91 country music festival shooting occurred, MRNV, together with other partners and allies in Las Vegas, have supported more than 70 immigrants that were working the event that tragic evening. MRNV has made sure to provide Spanish resources to the those who need them alongside others like Bilingual Behavioral Services (BBS) Counseling Center, Legal Aid Center of Southern Nevada, the UNLV Thomas & Mack Legal Clinic, La Alianza Comunitaria Transnacional, and the Arriba Las Vegas Workers Center. 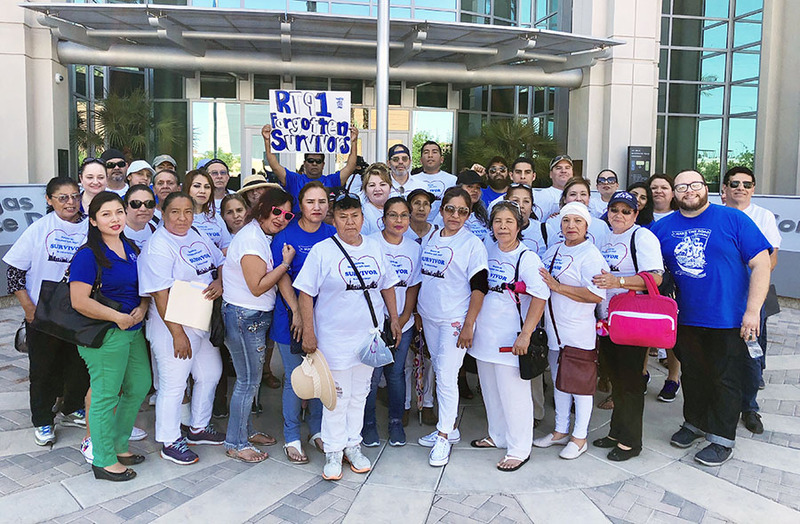 From providing emotional support to legal assistance, MRNV also took action to support its members, pushing for a U-Visa Immigration application process with the hopes that something positive could result from a tragedy that has marked the rest their lives. This process is set aside for victims of certain crimes who have suffered mental or physical abuse and are helpful to law enforcement or government officials in the investigation or prosecution of criminal activity. Outside police headquarters, 4 MRNV members shared their stories exactly as they lived them last October. In the meeting was also North Las Vegas City Councilman, Isaac Barron, who has advocated for the victims of the shooting. The survivors were in different places at the venue--some were cleaning the restrooms, others at the food stands and many were behind the stage. Sheriff Lombardo actively listened to the horrifying stories and announced to the group his department’s move to add more staff capacity to review the U-Visa applications from the victims of the shooting in order to clear up the backlog. Receiving such certification from the police department is necessary in order for MRNV members to move forward with their U-Visa applications. MRNV sees this has an important victory for its members and many others working to help this group obtain justice after the tragic events of October 1, 2017. Even though it’s a huge step forward for victims and the organization, they will both continue to hold authorities accountable on their promise to review the victim’s applications.